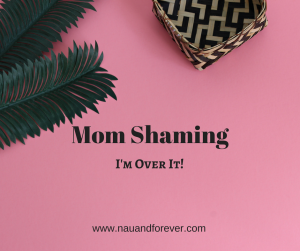 Let’s talk about Mom shaming. Just typing the phrase annoys me. I am all about empowering each other. I am all about spreading positivity. I am all about cheering each other on. I’m willing to bet we have all been shamed. Shamed for staying home with our kids. Shamed for working outside the home. Shamed for letting our kids watch TV. Shamed for not allowing our kids screen time. Shamed for for doing both. Shamed for nursing our toddlers. Shamed for giving our kids cheetos. Shamed for feeding our kids healthy foods. Shamed for going on a girls’ weekend getaway. Shamed for not wanting to go on the girls’ weekend. Shamed for wearing yoga pants and no makeup. Shamed for always being “put together”. Shamed for working out every day and having a break from the kiddos. Shamed for not “taking care of yourself”. Seriously. STOP IT! I am so over it. 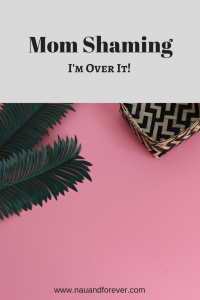 Being a mom is hard! Constantly wondering “am I doing this right?” “Should I do that instead?” The last thing we need is to be judged by people who should be supporting us. I have been shamed for the decisions I make. And I’m over it. We will not always agree and that’s ok. We are doing our best and what we believe is best for our family. Imagine a world where we cheered each other on. A world where we loved on our fellow mamas. I encourage you to think of a mama in your life. Write her a letter. Send her a text. Grab her a coffee. Tell her you love her and are proud of her because she’s doing a damn good job! Be sure to sign up here for our Newsletter to receive a weekly dose of love and positivity!